Throw players of all skill levels and ages into one ring. 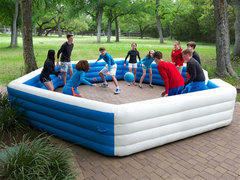 Toss in one soft foam gaga ball and blast some music! All players have one hand on the edge of the three-foot-high ring. When the ball hits the ground, they yell “Ga!” When it bounces again, they yell “Ga!” Suspense builds as the ball comes down for a third time and they scream “Go!” Hands come off the rails, feet shuffle and the ball is live. You can only hit the ball with an open hand and cannot hit it twice in a row; it must touch the boundary wall or another player first. Your goal is to eliminate all other players by hitting them with the ball below the knees.